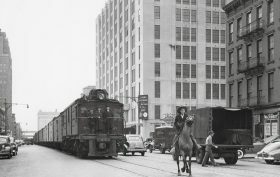 West Side Cowboy on Death Avenue, via Kalmbach Publishing Co. The now-defunct elevated train lines of Manhattan are well known today thanks to their reincarnation as the High Line. But before this raised structure was put in place, the west side was home to a deadly train system appropriately referred to by locals as “The Butcher.” The full-size railway line ran from 1846 to 1941 between 10th and 11th Avenues without barriers, fences or platforms, earning the route the nickname “Death Avenue” before it was taken out of operation for causing more than 430 fatalities–deaths that not even true western cowboys could stop. Our ongoing series Apartment Living 101 is aimed at helping New Yorkers navigate the challenges of creating a happy home in the big city. 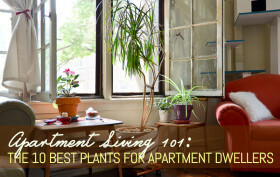 This week we tackle the issue of growing plants indoors when both space and light are limited. 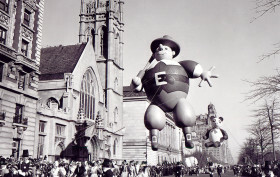 There are many famous traditions synonymous with New York City, and Macy’s Thanksgiving Day Parade is at the top of that list. The first parade marched down Broadway in the winter of 1924, and in the years since, it’s grown into an event with more than 3.5 million spectators. The parade is also televised on both NBC and CBS and boasts a whopping 50 million viewers. And like any long-standing NYC institutions, the history behind the festivities and larger-than-life balloons is certainly interesting. The holiday season is the time of year when seeing friends and family is hard to avoid. We also find ourselves with more vacation days during these winter months. However, even though these two holiday realities suggest cheer and relaxation, they don’t always mean we’re taking the necessary time to slow down and appreciate what really matters. 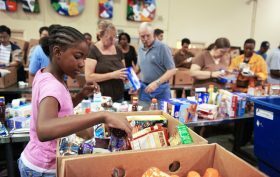 Instead of just eating and drinking your way through the next weeks, why not harness the holiday spirit and take a pause to help your fellow New Yorkers in need? There are hundreds of opportunities to volunteer from now through the New Year, and the list we’ve compiled below is a good place to start. Known for its record-breaking height and sophisticated Art Deco style, the Empire State Building is one of New York City’s, if not the world’s, most recognized landmarks. While the building is often used in popular culture as light-natured fodder—such as the opening back drop to your favorite cookie-cutter rom-com or the romantic meeting spot for star-crossed lovers—the building’s past is far more ominous than many of us realize. From failed suicide attempts to accidental plane crashes, its history casts a vibrant lineup of plot-lines and characters spanning the past ninety years. In many parts of Soho and Tribeca, the sidewalks are made from small circular glass bulbs instead of solid concrete. 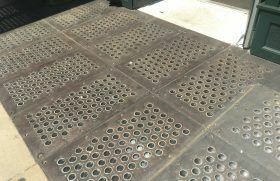 Known as “hollow sidewalks” or “vault lights,” the unique street coverings are remnants from the neighborhood’s industrial past when they provided light to the basement factories below before electricity was introduced. These skylight-like sidewalks first came about in the 1840s when these neighborhoods were transitioning from residential to commercial and when their signature cast iron buildings first started to rise. 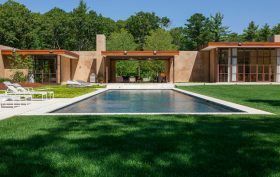 Those of us New Yorkers lucky enough to be heading out to the Hamptons this weekend may not as lucky to shack up in a stunning abode like this, but we all can dream. 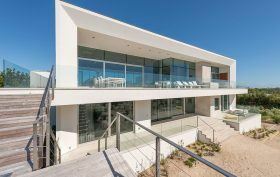 This contemporary home from Barnes Coy Architects is located in picturesque East Quogue and was strategically designed to feature views of both the Atlantic Ocean to the south and Shinnecock Bay to the north, all highlighted by stark white interiors. 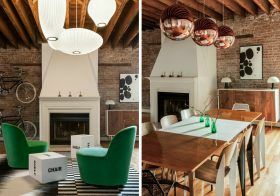 The New Design Project decked out a young couple’s urban residence with bursts of bold color, texture, and geometry, transforming the rustic Jersey City loft into a vibrant modern oasis. Integrated into the interior decor are several modern pieces, strategically placed among playful accents and ethnic touches–an unexpected yet seamless integration of various styles that’s become synonymous with the work of this edgy design duo. 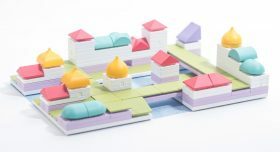 Arckit, an architectural model kit manufacturer, has recently added to its family of offerings a series of playful yet professional three-dimensional modeling sets designed to satisfy the needs of building professionals, as well as aspiring designers. Traditional methods of model building include “cut and glue” techniques or 3D drawings, but these kits, called Arckit Cityscape and Arckit Masterplan, provide the same tactile experience with no special skills required.